They happen every day at St. Jude and a family in Tennessee prays for one every day. My sister and her friend were expecting babies within 3 months of each other in 2010. 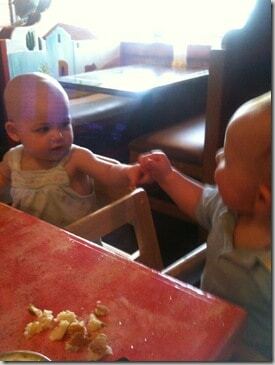 One boy and one girl. And they were perfect. They still are 🙂 We fell in love with our little Jackson and Monica’s friend had her little KB and all was perfect in their world. One night in June, I got a text from Monica. 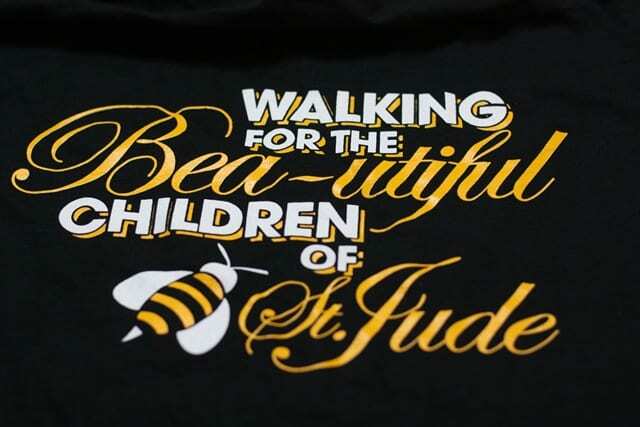 She and Nick were on their way to St. Jude to be with her friend because KB was diagnosed with something no child should ever have written next to their name: Neuroblastoma. She had just turned 1 year old. 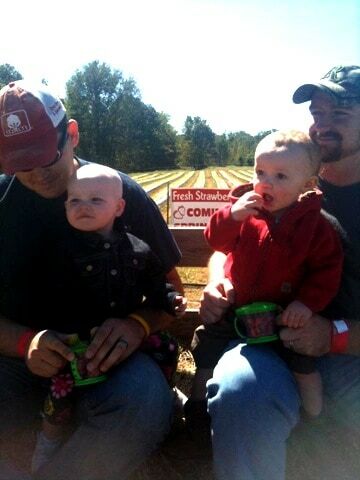 I don’t have to words to adequately express what the past few months have been like for this family. Once again, the power of facebook brings families together and that is how I went from running my first marathon because it was in Memphis and it “helped a lot of kids” to running it for KB. My hope is that she will one day run around and have people call her “crazy” for attempting anything she desires..professional dancer, singer, medical research, or being the best mother and wife she can be. She has a fighting spirit that got her through an incredibly long and risky brain surgery. They got 95% of the tumor. Now she is in the phase of waiting for a stem rescue. She needs her harvested stem cells transplanted into her bone marrow. When I start running Saturday morning, hopefully she will be sleeping peacefully within the walls of St. Jude. She’s fighting off a very rare bacterial infection so the stem rescue will be put off for a couple of weeks. After her stem rescue, she will have 100 days in St. Jude under critical observation for infection. She has a long haul ahead of her. The least I can do is run for her. After all, blisters do not require chemo. 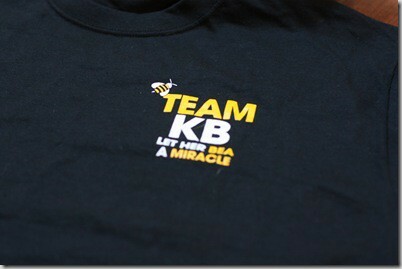 My Team KB shirt. 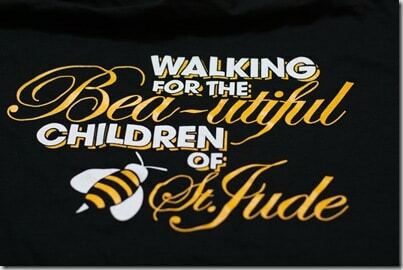 (The B is actually spelled “Bea”) These were made for a St. Jude walk a couple of weeks earlier. I could not get up there for the walk, so I’m wearing it for the marathon..and I’m sure I’ll be walking some. Team KB raised over $4,300 for St. Jude. 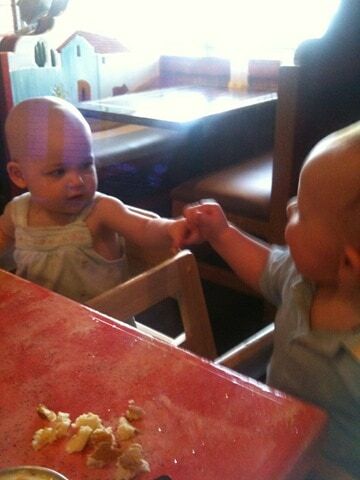 KB and Jackson on their lunch date this summer. 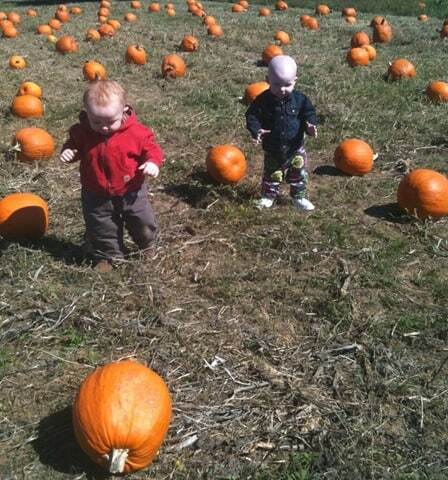 Their trip to the Pumpkin Patch. And one of my favorites of her. She often wears this awesome pink skirt. I want one just like it. 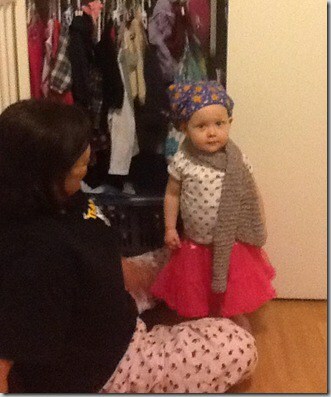 She has much better fashion style than I do and I trust her judgment with this skirt ;-). Keep fighting, KB. You have a whole crew across a few states praying for you daily. Previous Post: « Brrr…Fall is gone.